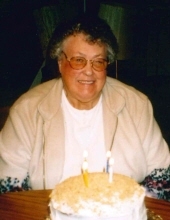 Frances Johanna Doll, 86, of Bozeman, passed away Saturday, March 23, 2019. She was born March 13, 1933 in Glendive, MT to Leopold and Jessica (Kent) Molenda. She was raised and educated in Glendive, Oregon and Missoula. She went on to telegraph school after her high school graduation, and then worked as a telegrapher for Northern Pacific and Burlington Northern Railroad for 34 years. While working for the railroad she met the love of her life Michael Doll. Frances and Mike were married on June 9, 1954 in Sheridan, MT and they were blessed with four children Lon, Laura, Kari and Joleen. During her life, she lived in Glendive, Polson, and Oregon, including Dexter, Oak Ridge and West Fir, before moving back to Montana, first to Missoula and finally settling in Bozeman. Frances’ hobbies included sewing, crafts, gardening and birdwatching. Frances was preceded in death by her parents, her husband Mike, four sisters and two brothers (Gladys, Beverly, Carol, Sharon, Stanley and Gordon) in a fire in 1950, brother Kenneth Molenda in 1983 and sister Joyce Bethke in 2014. Survivors include her son Lon (Ramona) of Billings, MT; three daughters Laura (Jon) Cundiff of Tulsa, OK, Kari Doll and Joleen (Chris) Howell both of Bozeman, MT; three grandchildren Navarre Larsen and Michael and Daniel Howell all of Bozeman, MT; five siblings Ronald Lee Molenda of San Jose, CA, Richard Eldon Molenda of Polson, MT, Bob (Jackie) Molenda, of Seattle, WA, Linda Johnson of Missoula, MT and Waneta Gardiner of St. Cloud, FL. Visitation will be held Sunday starting at 3:00 PM, a forester Rosary will be held at 3:30 PM, followed by a Vigil at 4:00 PM Sunday, March 31, 2019 at Dahl Funeral & Cremation Service Tribute Center. A funeral mass will be held at 10:00 AM Monday, April 1, 2019 at Holy Rosary Catholic Church, followed by burial at Sunset Hills Cemetery. Memorials may be made to Holy Rosary Catholic Church, 220 W. Main, Bozeman, MT 59715. To send flowers or a remembrance gift to the family of Frances Johanna Doll, please visit our Tribute Store. Followed by a forester Rosary at 3:30 pm and a Vigil at 4:00 pm. Followed by burial at Sunset Hills Cemetery. "Email Address" would like to share the life celebration of Frances Johanna Doll. Click on the "link" to go to share a favorite memory or leave a condolence message for the family.